I have long been an advocate of the humble button mushroom. It’s one of these ingredients that’s so commonplace, I reckon it’s not appreciated to its full potential. A staple in your greasy breakfast fry-up, or as a mediocre ‘cream of mushroom soup’, the button mushroom is actually so much better that you might realise. They are high in umami – the taste that makes things savory – and they have a lot of powerful flavour locked inside. One of their characteristics is that they have an extremely high water content, making the flavour rather bland until you have reduced the moisture. I’ve also found that when you fry them in a hot pan with a pinch of salt until they’re dark and caramelised, the flavour is amazingly intense and savory. This is what gave me the idea of doing a roast mushroom soup. It’d be better than the average mushroom soup as it would be a rich golden colour, instead of grey, and the resulting flavour would be all the more powerful. Set 12 mushrooms aside, and slice the rest of them in half. Sprinkle the halved mushrooms with the sea salt so they’re evenly covered, then place in a colander set over a bowl. Leave in the fridge for about 6 hours, or overnight. Heat the oven to 180C, and put a medium sized roasting tray in to heat up. Briefly rinse the mushrooms with cold water, then squeeze them with your hands to remove as much moisture as possible. Pat them dry with kitchen paper. Heat 2 tablespoons of the olive oil in the roasting tray, then add the mushrooms along with 2 sprigs of rosemary. Roast the mushrooms, tossing occasionally, until they are dark and caramelised. Meanwhile, thinly slice the onion and garlic, and dice the bacon. Heat 2 tablespoons of olive oil in a medium pot and fry the bacon over a high heat until crisp. Turn the heat down and sweat the onion and garlic slowly for about 20 minutes, until soft and sweet. Once the mushrooms are nicely coloured, remove the rosemary from the roasting tray and add the mushrooms to the pan of onions. Add about 1 litre of chicken stock - enough to just cover the mushrooms - and bring to a gentle simmer. Cover with a lid, and simmer for 30 minutes, topping up with chicken stock when it reduces too much. Blend the soup in a food processor on full power for 5 minutes, until you have a silky smooth texture. You may need to add a little more stock to get the required consistency. To finish; slice the 12 reserved mushrooms in half, season with salt and sauté them to get a nice roasted colour. Pick the leaves from the remaining rosemary sprig and fry these in olive oil until just crisp. 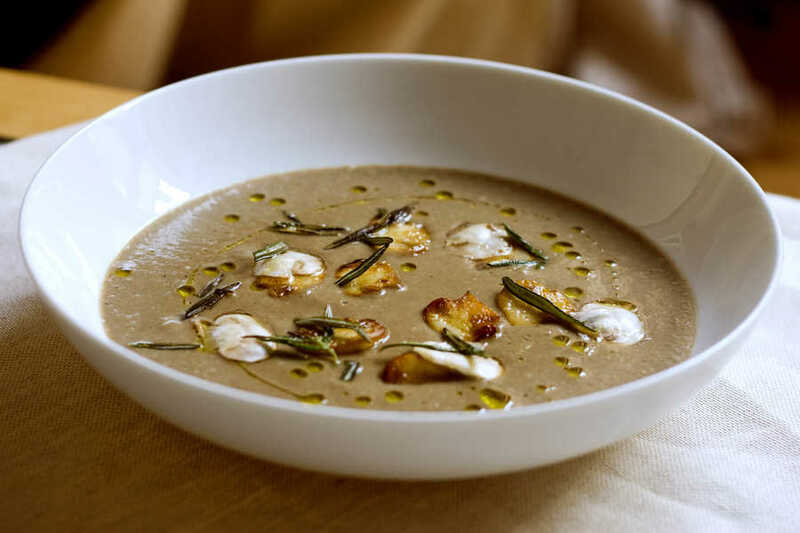 Scatter the mushrooms and rosemary over the soup along with a drizzle of olive oil.